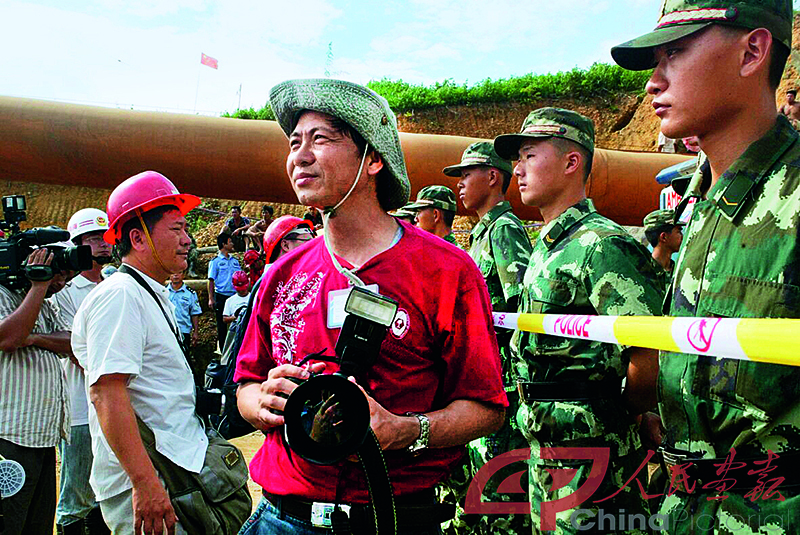 Over the past 30 years, Huang Yiming, honorary president of the Hainan Photographers Association, has exposed more than 100,000 frames of film to document the development and changes of the Hainan Special Economic Zone from every angle. My gut told me that the next day, April 26, Hainan Province would be officially born. “This sign will surely be hung on the front of a government building,” I thought. I felt excited and rushed to the office to get my camera. As I anticipated, staffers were making various preparations to hang the signboard. An employee in white shirt climbed a bamboo ladder propped against the gate and reached for a piece of red satin raised by two other staff members. When mounting of the large plaque was complete, I clicked the shutter, capturing a precious moment heralding the founding of Hainan Province. I was unable to adequately capture the big scene of the April 26 inaugural ceremony of the Hainan Provincial CPC (Communist Party of China) Committee because others had reserved the best locations. I was left to squeeze in front of the provincial leaders to shoot. The area was so crowded with people and journalists that most of my photos turned out vague due to the chaos. Soon after the ceremony, the leaders marched to the gate of the government building 100 meters away to participate in another inauguration ceremony for the provincial government. I learned my lesson before and wasted no time securing an ideal spot from which I could capture the grand scene of the ceremony, including the honor guards of the Young Pioneers. The unveiling ceremony was brief and enthusiastic. After it ended, many people stayed for quite some time waiting for a chance to take a photo in front of the plaque of the provincial government. Someone described the 1980s as “the years of burning passion” for Hainan. After Hainan Province was established, young dream chasers streamed in from all corners of the country. Most sought opportunities from the “talent wall” erected by East Lake, a famed gathering place for job seekers. I paid frequent visits specifically to take photos. My documentary series “East Lake Talent Wall” and “Hunting for Jobs” were both shot in this area in the late 1980s and early 1990s. The “East Lake Talent Wall” series became iconic of Hainan dream chasers in those days. “Hunting for Jobs” captured a glimpse of a group of young newcomers to Hainan, checking job postings on a small board hung on a coconut tree. 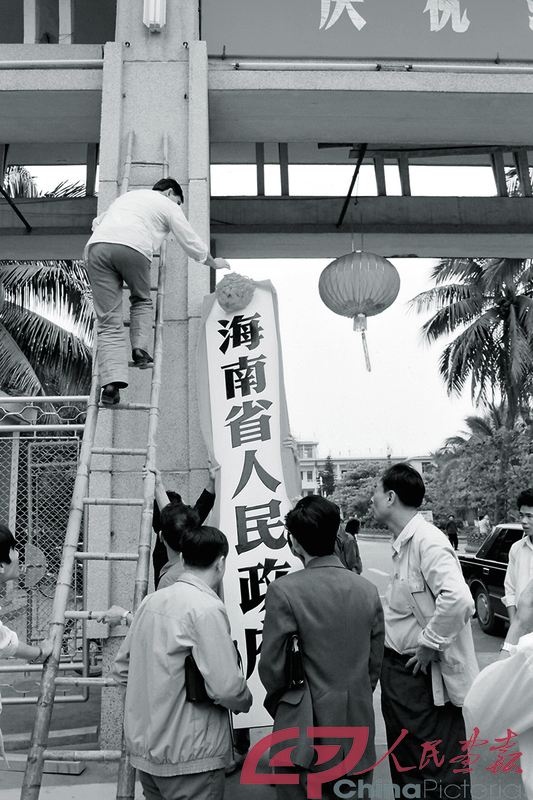 In the 1990s, the burst of a real estate bubble in Hainan inflicted heavy trauma on the urbanization of the province. Unfinished high-rises were left one next to another silently. It pained me to see such scenes. So I focused my lens on such a sensitive social phenomenon of that time: Hainan's suspended real estate projects. In 1999, China Photographic Publishing House published my series “Hainan in Black-and-White,” which drew attention from the real estate administration department. In February 2001, Boao Town at the estuary of the Wanquan River in Qionghai City, Hainan, hosted the first Boao Forum for Asia (BFA), jointly launched by 25 Asian countries and Australia. Hainan was no longer a small isolated island. I could hardly imagine tracking its footprints for 30 years without the aid of a camera. With more than 100,000 photos I snapped, I have documented the changes in the Hainan Special Economic Zone from every angle.